Just shy of 35 years since Don Óscar Romero was assassinated while saying Mass in a hospital chapel, earlier today the Pope capped the lengthy fight for the church's recognition of the late archbishop of San Salvador by ratifying his martyrdom "in odium fidei" ("out of hatred for the faith"), thus clearing the final procedural hurdle to Romero's beatification without the need for a first miracle. While the decree was essentially a formality given Francis' on-record intent to move the long-stalled cause – especially after the unanimous vote last month affirming Romero's martyrdom by the Congregation for the Causes of Saints – the timing of the necessary final step particularly reflects the Pope's determination to see the process through as well as his oft-discounted dedication to popular piety: today marks the memorial of St Ansgar, the 9th century bishop of Hamburg whose name translates in Spanish as Óscar, hence it's Romero's patronal feast... and with it, already St Óscar's Day. 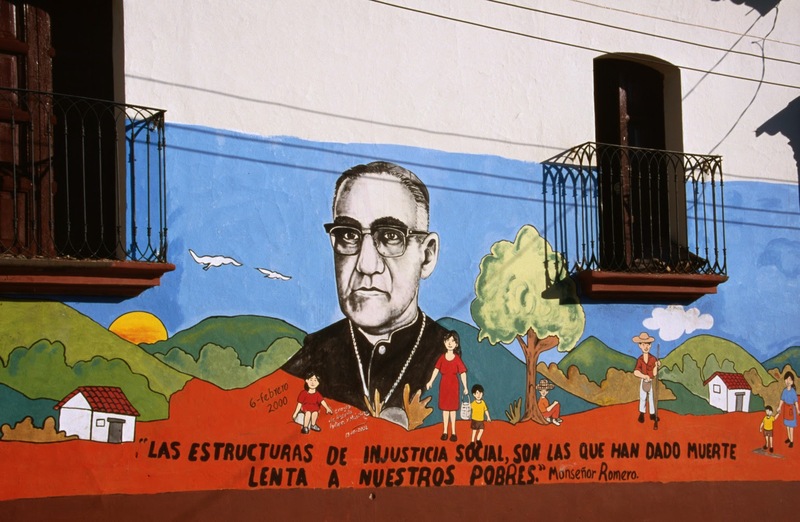 In addition, according to the El Salvador-based Super Martyrio site, this 3 February is the anniversary of Romero's 1977 appointment as archbishop of the country's capital. Having assiduously reported every curve of the Romero cause, the Salvadoran outlet said that while the process had indeed long been blocked in Rome "on suspicion of doctrinal irregularities and ideological exploitation by the Left," its resistance did not come from Popes John Paul II and Benedict XVI, but "from the Vatican Curia," principally in the figures of two Colombian cardinals, Dario Castrillón Hoyos and the late Alfonso Lopez Trujillo, whose respective ascents both reflected what became a staunch doctrinal and cultural conservatism in the face of liberation theology's dominance in the trenches of the Latin American scene. His elevation long a cause celebre among the church's social-justice wing given Romero's outspokenness as archbishop on behalf of the downtrodden and against the state-condoned murders of clerics and others who advocated for them, despite earlier speculation that Francis would reserve the beatification rites to himself – whether on a visit to El Salvador or at a Mass in Rome itself – and even that he might move for an immediate canonization, the Pope himself nixed the theories on his return from Manila in mid-January, when he joked during the in-flight presser that "there will be a war" between the Vatican's Saint-making chief, Cardinal Angelo Amato SDB, and the cause's postulator (lead coordinator), the Curia's Family Czar Archbishop Vincenzo Paglia, over "which one will celebrate the beatification," indicating that it would take place on Romero's home-turf. The martyrdom vote by Causes of Saints now understood to have been the cause of his last-minute backing out of a scheduled US trip in early January, Paglia will lead a briefing on the beatification tomorrow morning in the Holy See Press Office. To date, no indication on the timeline for the ceremonies has yet emerged. Once the rites have taken place, it's worth reminding that – at least, in the conventional understanding of things – beatification admits the public veneration of the Blessed on the local level solely in the place(s) where the person lived and served; only canonization extends the local cultus to the universal church. That said, in cases like Romero's where, beyond a blessed's primary mission-field, a genuine "cult following" is evident (in the way that coined the term), other episcopal conferences may move to petition Rome to add the feast to their national calendars. 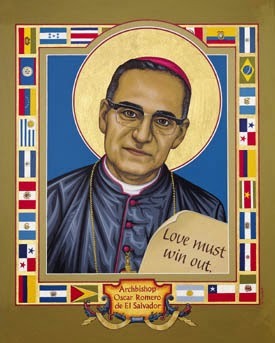 In other words, as the soon-to-be Blessed Oscar's following indeed runs rather strong among diverse elements of US Catholicism – and almost as much, amid the ongoing scrutiny from some quarters over the degree of the Stateside bench's affinity for Francis and his missionary orientation for the church – a USCCB move to add Romero's feast to the domestic calendar would serve as a potent signal that the bishops have indeed signed up to this pontificate's songbook. In any case, while the 24 March anniversary of Romero's murder has no other conflicting feasts, the date's frequent occurrence during Holy Week (which would prevent it from being observed in any fashion) suggests that another option will be sought. The archbishop's anniversary is now marked by the United Nations as a global day "for the right to truth concerning human rights violations and for the dignity of victims." The holy Mass, now, this Eucharist, is just such an act of faith. To Christian faith at this moment the voice of diatribe appears changed for the body of the Lord, who offered himself for the redemption of the world, and in this chalice the wine is transformed into the blood that was the price of salvation. May this body immolated and this blood sacrificed for humans nourish us also, so that we may give our body and our blood to suffering and to pain --- like Christ, not for self, but to bring about justice and peace for our people.